From very soon, I’ll be making public my work on the translation of historical material linked to the DEAF community. The first work that I’ll be doing is linked to the Banquets des Sourds-Muets (the Deaf-Mute Banquets) that originated in the Parisian Deaf community in the 1830s and that have been copied/contested in one form or another up to the present day. I will be working on the translation of this entirely publicly… publishing the original, the translation and any commentary on it as I produce it. The translation will be available for review and comment, and I’m hoping that these comments (and the body of work that will emerge) will form a part of the whole. There are two primary aims to making this work public at this point, and in this way. The first is that, if I wait until there is funding to publish the work formally, it will – likely – never happen. I can’t wait for that… so I’m going to do it transformatively, as previously discussed. 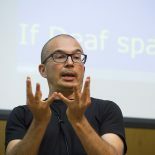 The second is that – in my experience – historical research carried out either on, or by the Deaf community and the Deaf Studies communities is something of a secret art that is often not open to public scrutiny. My plan is to make all of my work public so that the ins and outs of it can be seen, and – thereby – promote ongoing engagement with the historical process and not just with the historical material that it produces. This entry was posted on November 3, 2010 by Mike Gulliver in DEAF history and tagged Banquets, Community, DEAF history, Engagement, Historiography, Publication, Transformative publication.